The service pack for Windows 7 has been out for a bit and most users have downloaded it either from Microsoft's Download Center or Windows Update. Windows Update user without doubt have the most comfortable update process ahead of them, as they just need to watch and wait until the update is downloaded and installed. Windows users who have selected Microsoft's Download Center instead have to download an iso image of the service pack that they need to burn to DVD before it can be used to update the operating system. 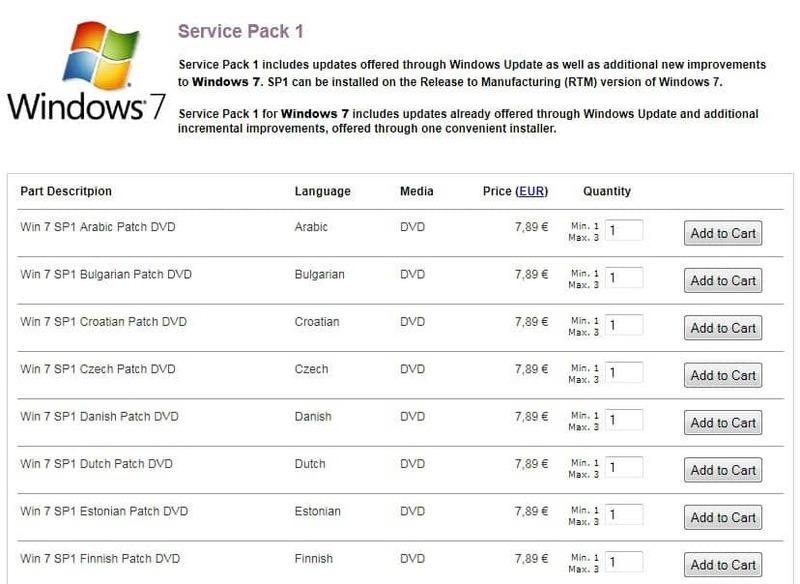 A third possibility, ordering the Windows 7 Service Pack 1 from Microsoft, is now available. This can be handy for users without Internet access on a computer, and no friend nearby who could download the ISO image to the computer. It is also the best option for users who want an official Microsoft DVD that contains the service pack for Windows 7. The product media itself is free of charge, but a shipping and handling fee applies. Windows users basically need to select their country from the list before they can add up to three Windows 7 SP1 DVDs max of each language to their shopping cart. 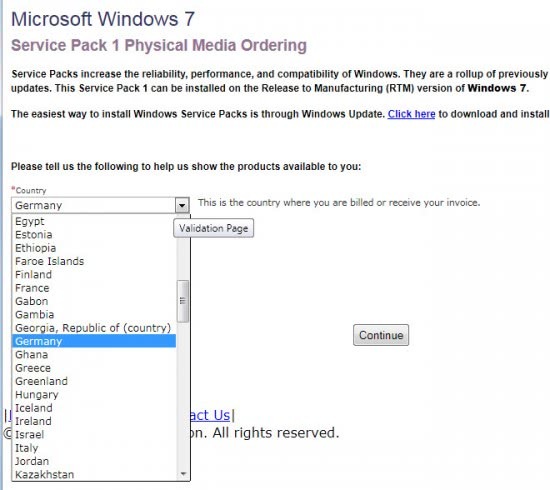 All Windows 7 language and regional editions are available for selection, regardless of the country that the user resides in. Please note that English contains all English editions of Windows 7, the same is true for German and any other language that is spoken in multiple countries. The price per DVD is around $10 and the quantity limit has been set to three for each language. It seems to be possible to order more than three DVDs, but only if they are different language versions. The checkout lists the selected Windows 7 DVDs, their price and the subtotal. Users who proceed with the order need to fill out their contact information and shipping address afterwards. The same page offers the average lead time for the regions available. Western-European users can expect the DVDs in about 4-8 business days, Eastern-European users in 1-2 weeks and African and Middle East users in about 3 weeks. Payment options may differ depending on the location of the customer. Credit Card and wiring the amount seem to be commonly available though. It is less expensive and a lot faster to download the ISO image instead from Microsoft Download.